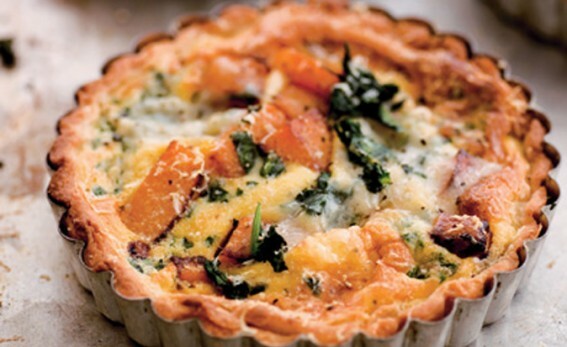 Pumpkins and squash are great in tarts. It’s that mixture of the sweet and the salty in savoury pumpkin pies that really gets me. This makes one large pie or 6 small ones. For the pastry, put the flour, butter and salt into the food processor and, using the plastic blade, process the mixture until it resembles breadcrumbs. Add just enough water to make the pastry come together. Wrap it in foil or clingfilm and refrigerate for about half an hour. Preheat the oven to 180°c/350°f/gas mark 4. Cut your pumpkin from top to bottom into broad slices, remove the inner stringy bits and seeds, and peel. Brush lightly with olive oil and bake in the preheated oven for 20 minutes, or until just tender. De-stalk and wash the spinach. Put it into a large saucepan, cover, and wilt in the water left clinging to it (about 4 minutes over a medium heat). Drain well and leave to cool. Make the custard by mixing together the whole eggs, egg yolk, cream and Parmesan. Season well. Roll out the rested pastry and line a tart tin 23cm (9in) in diameter and 4cm (1 ½in) deep. Chill for another 30 minutes (or just stick it in the freezer for about 15 minutes). Prick the bottom of the tart and bake blind – line the pastry with greaseproof paper and put ceramic baking beans or ordinary dried beans on top – in the preheated oven for 7 minutes. Remove the paper and beans and cook for another 4 minutes. Cut the pumpkin into small slices, about 10cm (4in) long and 1cm (½in) thick. Squeeze every last bit of water from the spinach and chop it up. Season both of these and add some freshly grated nutmeg to the spinach. Spread the spinach over the bottom of the tart case, then add the slices of pumpkin and dot with nuggets of Gorgonzola. Pour the custard mixture over the tart and bake, again at 180°c/350°f/gas mark 4, for 40 minutes for 1 large pie and 25-30 minutes for smaller ones, or until the pastry is golden. Leave for 10 minutes to let the custard finish cooking and set a little once you have taken it out of the oven.